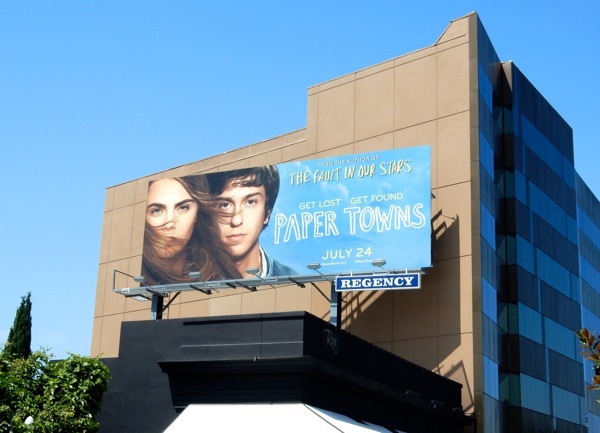 If you're a sucker for young love and coming-of-age stories, then you'll probably enjoy Paper Towns, the second big screen adaptation from the author of The Fault in Our Stars, John Green. 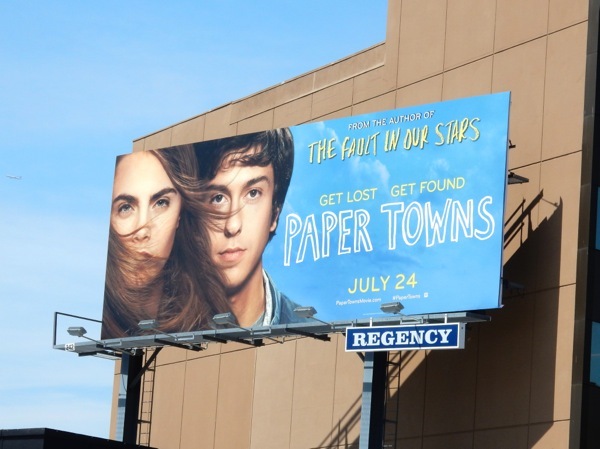 Nat Wolff stars as 'Quentin "Q" Jacobsen', a Florida teenager with feelings for his childhood friend and enigmatic neighbour, 'Margo Roth Spiegelman' (Cara Delevingne). One night this coolest and most mysterious of girls climbs in through his bedroom window to borrow his car and exact revenge against her cheating boyfriend, and the next day she's gone, leaving clues to her disappearance which takes Q on a journey of self-discovery with his friends. 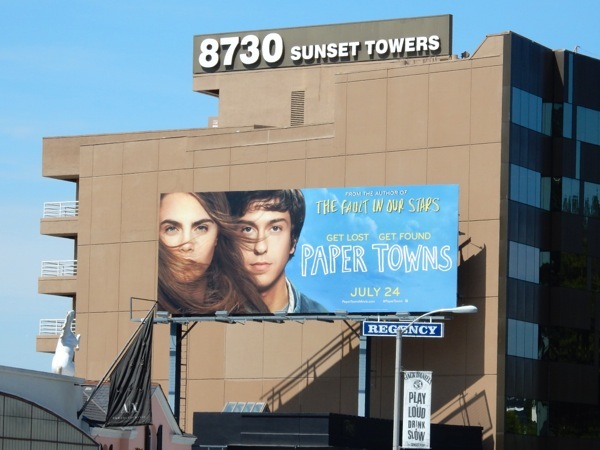 This Paper Towns movie billboard, featuring a lot of 'hairography', was snapped along L.A.'s Sunset Plaza on June 30, 2015. 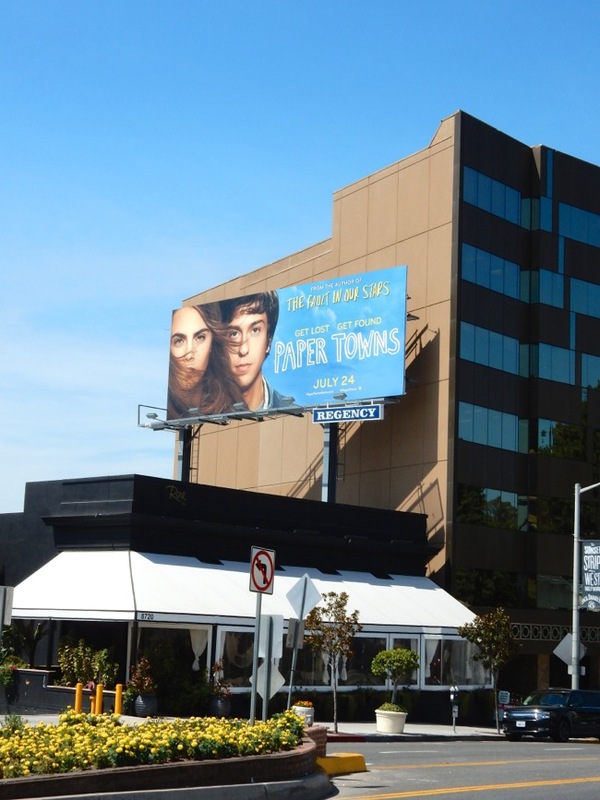 If you're a fan of fashion supermodel Cara Delevingne, be sure to see more of her in this revealing Tom Ford Black Orchid fragrance billboard and in these My Burberry fragrance billboards. Will you be found watching this film at the cinema this weekend, or would you prefer to get lost in the pages of the original book?